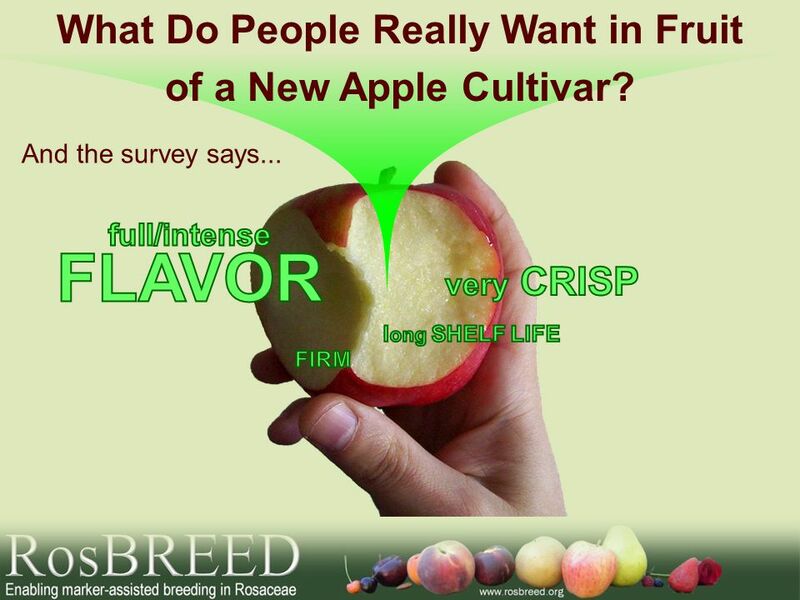 6 And the survey says... What Do People Really Want in Fruit of a New Apple Cultivar? 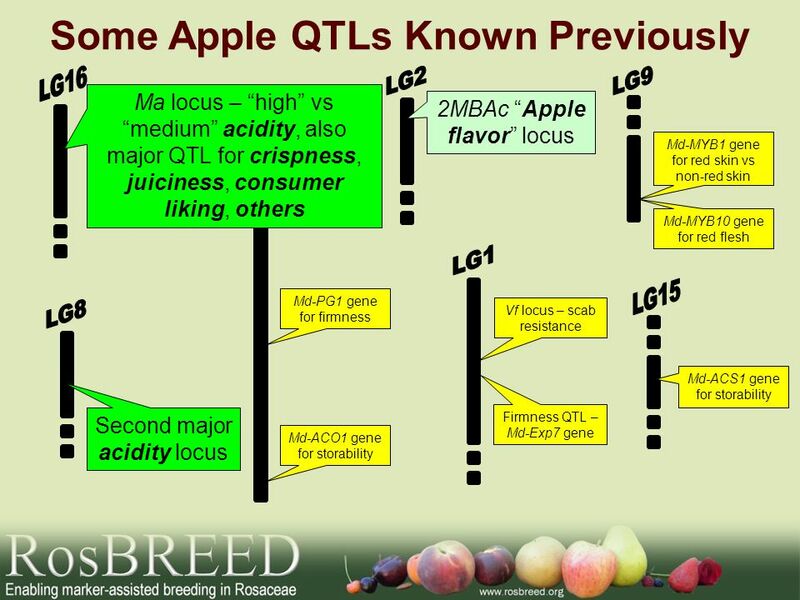 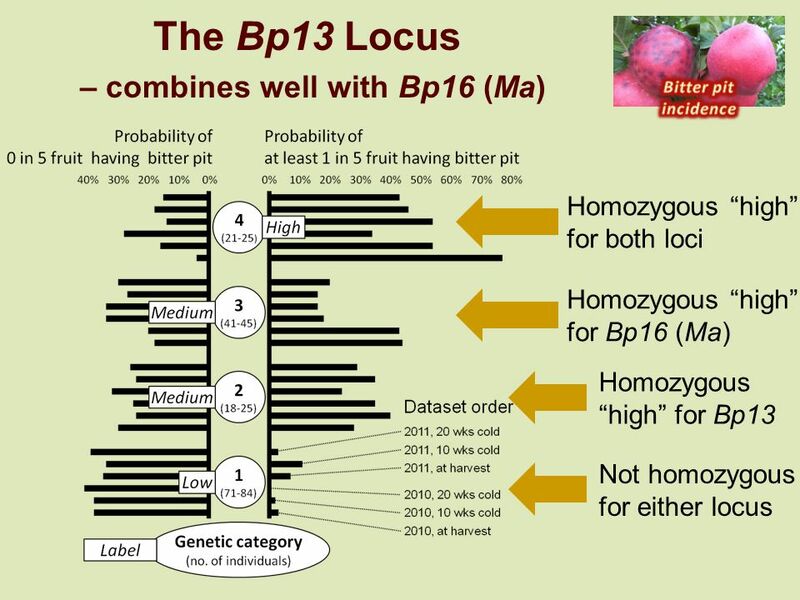 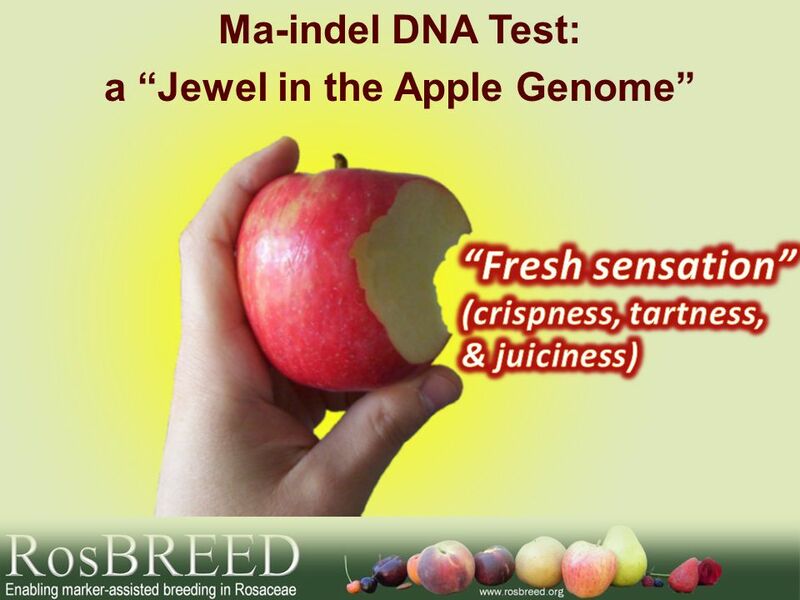 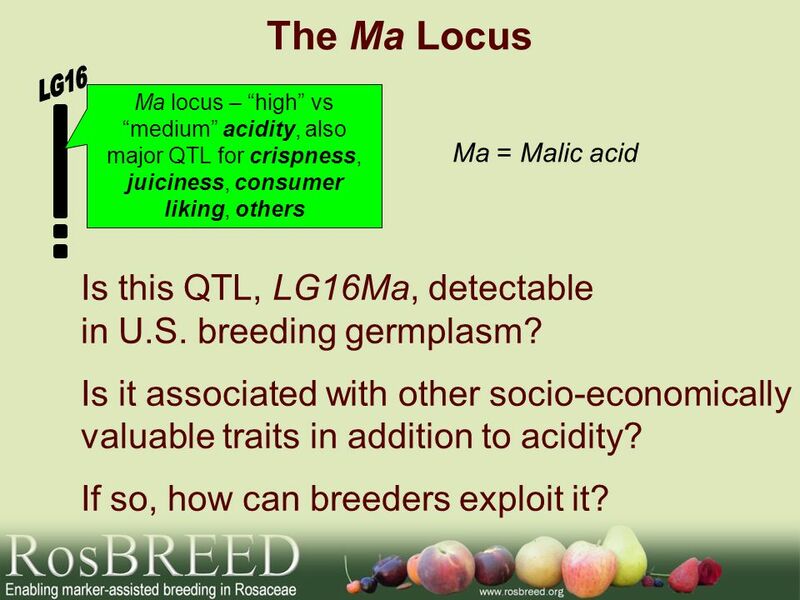 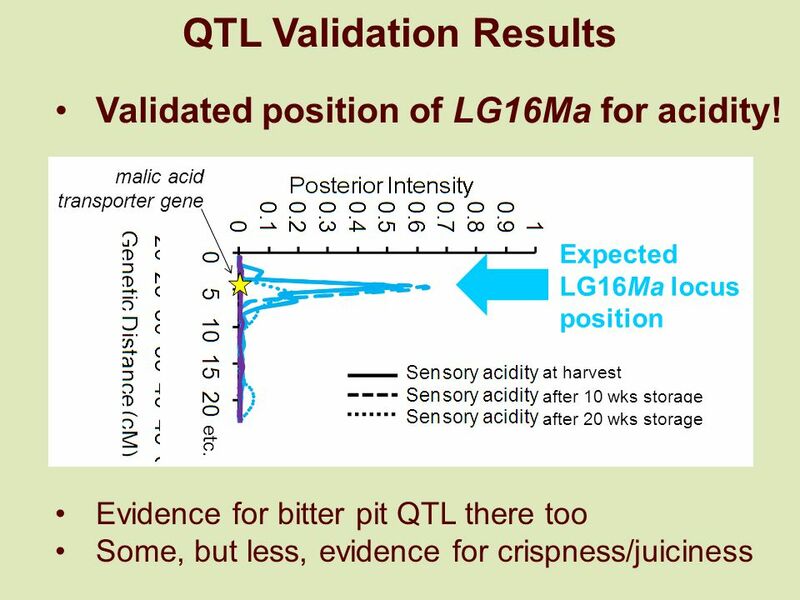 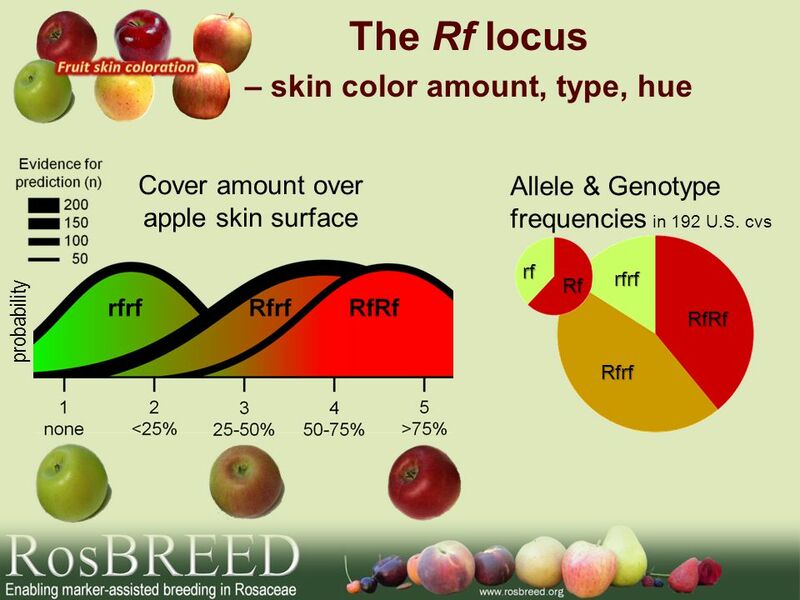 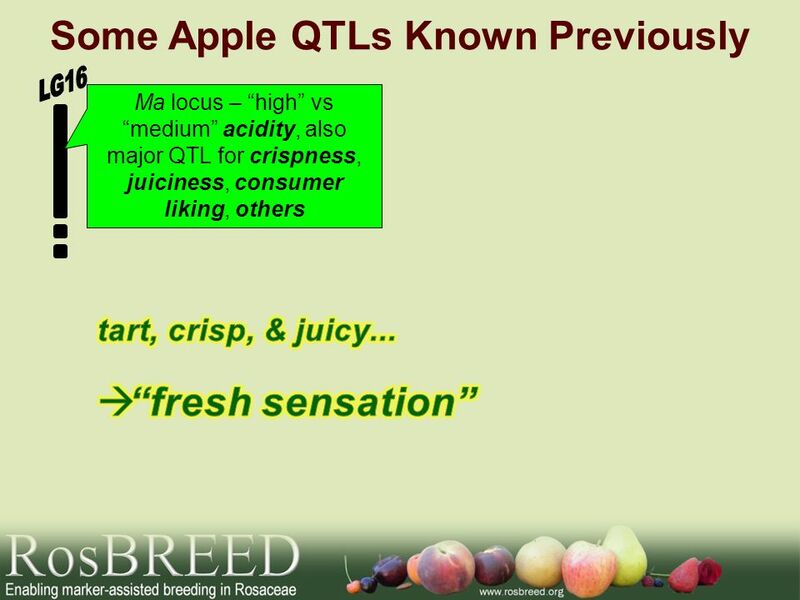 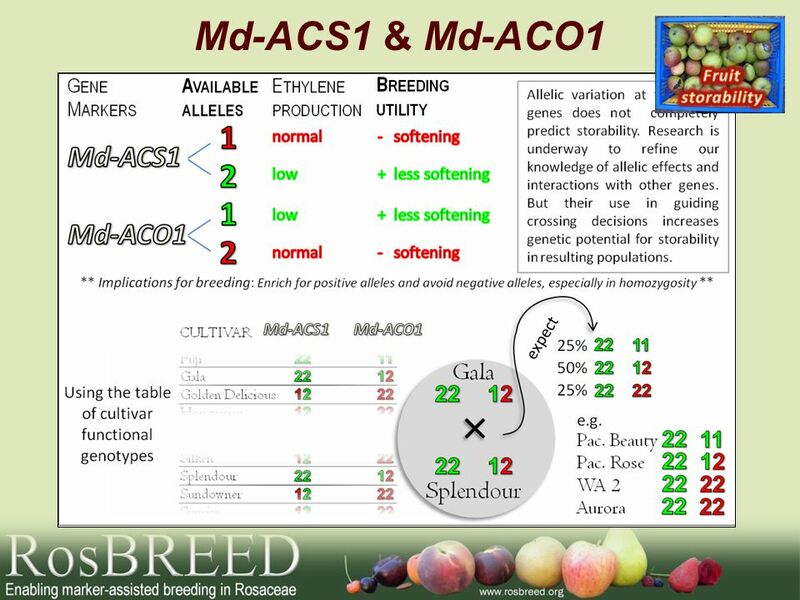 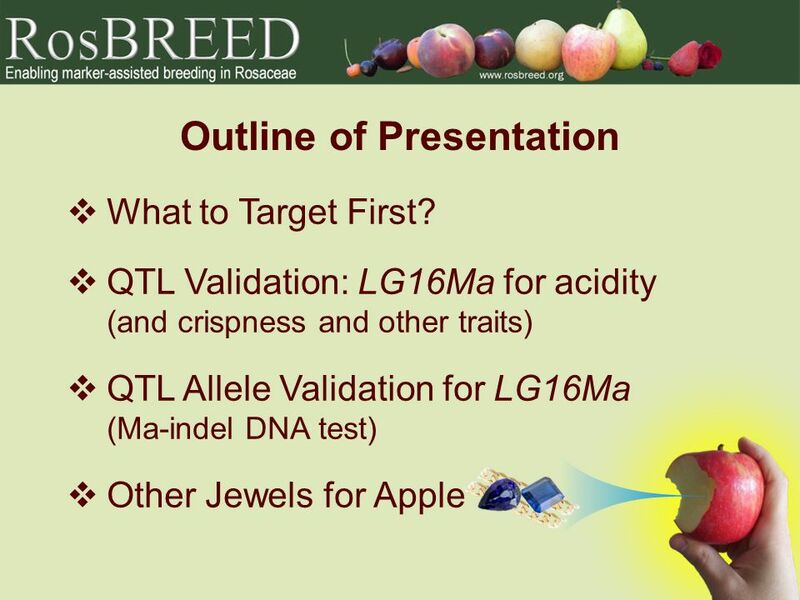 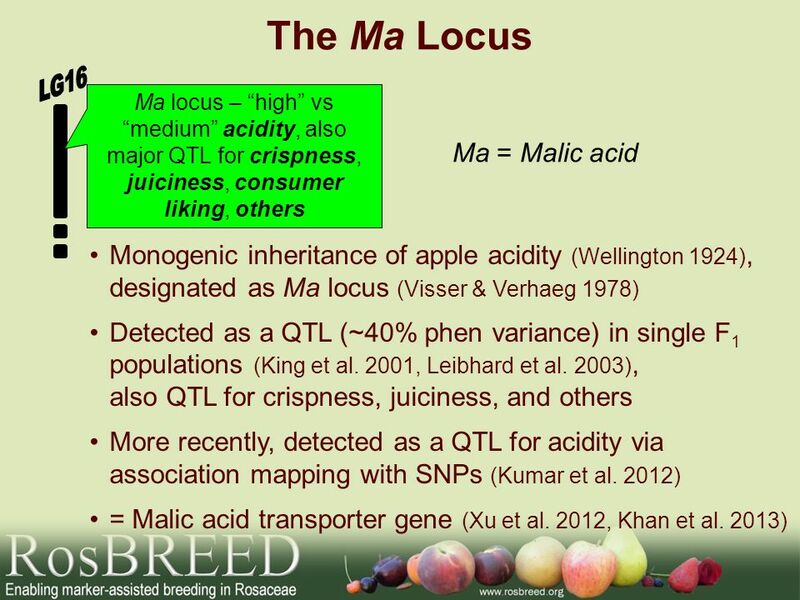 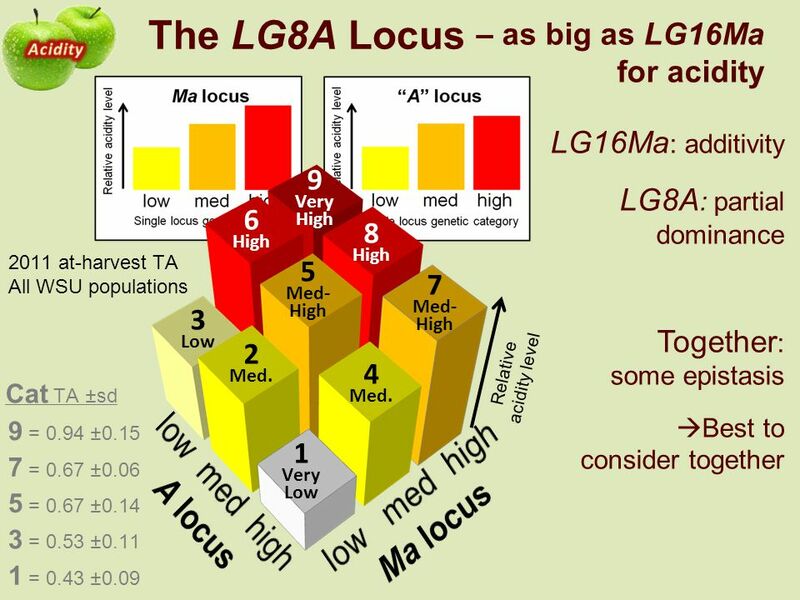 10 The Ma Locus Ma = Malic acid Ma locus – “high” vs “medium” acidity, also major QTL for crispness, juiciness, consumer liking, others Is this QTL, LG16Ma, detectable in U.S. breeding germplasm? 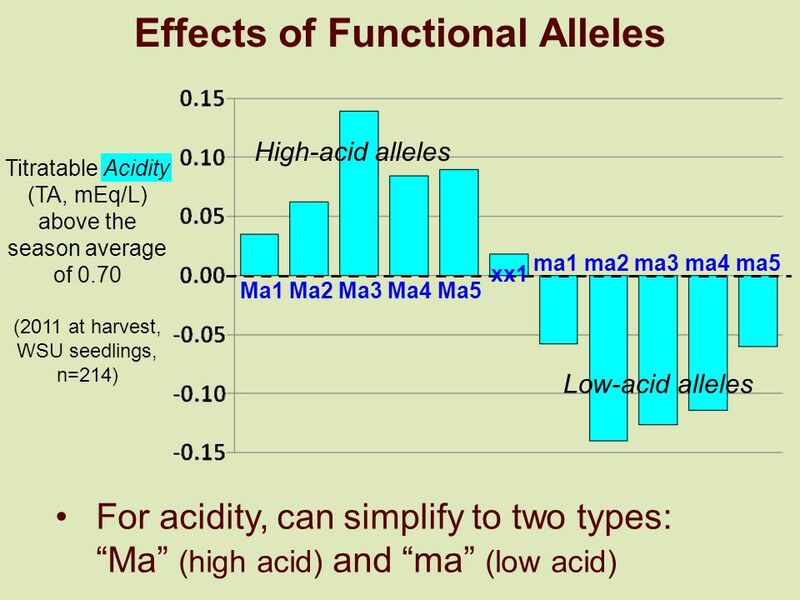 Is it associated with other socio-economically valuable traits in addition to acidity? 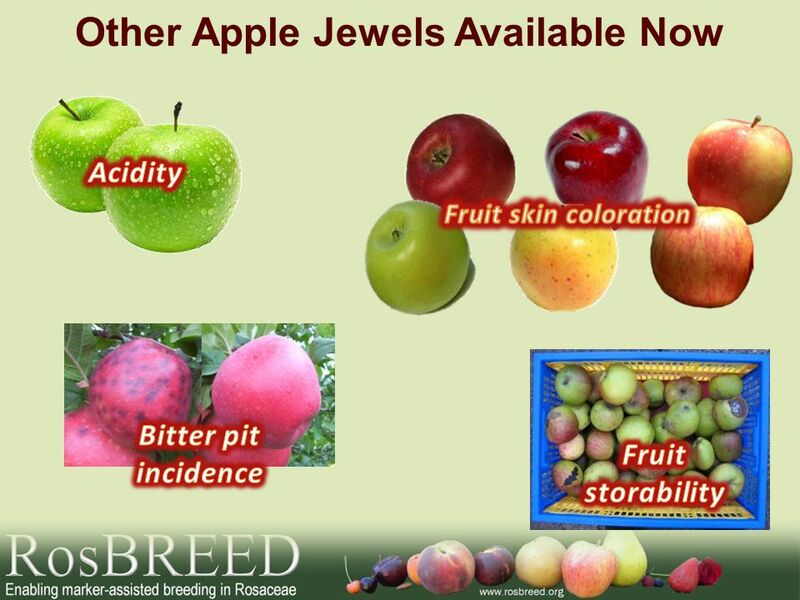 If so, how can breeders exploit it? 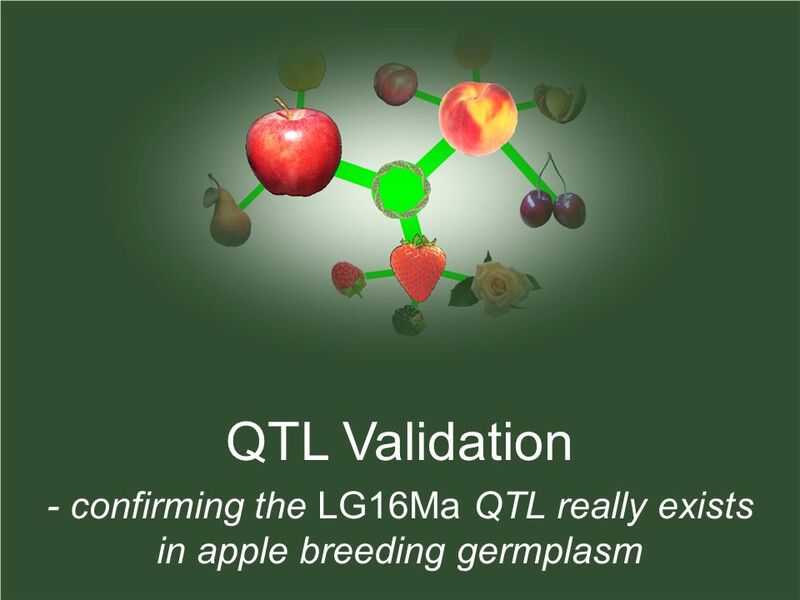 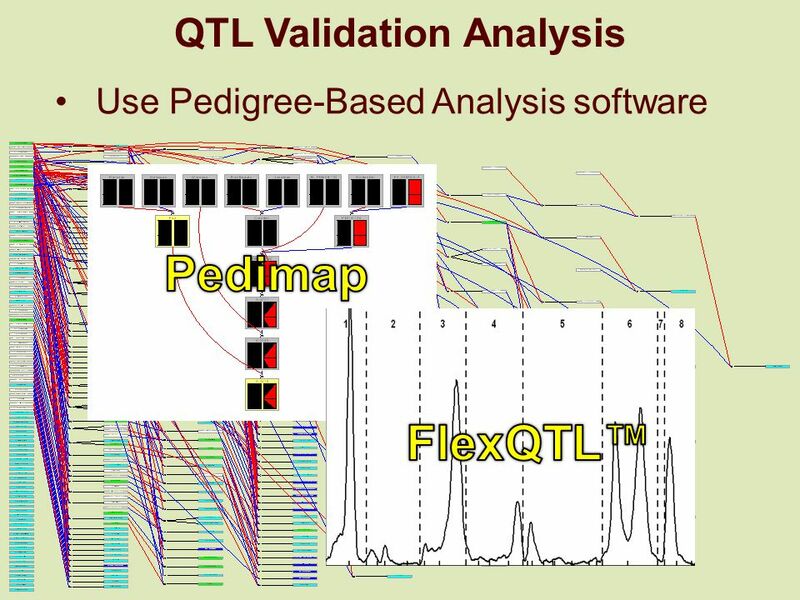 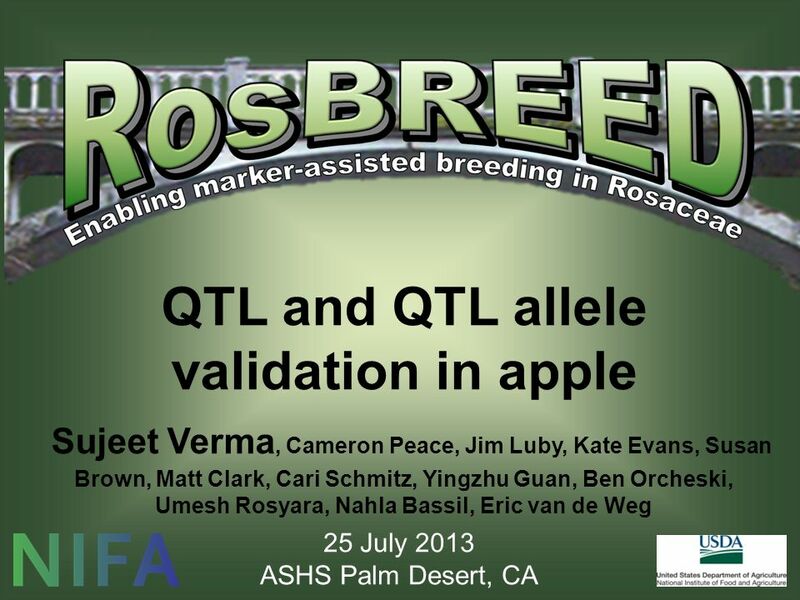 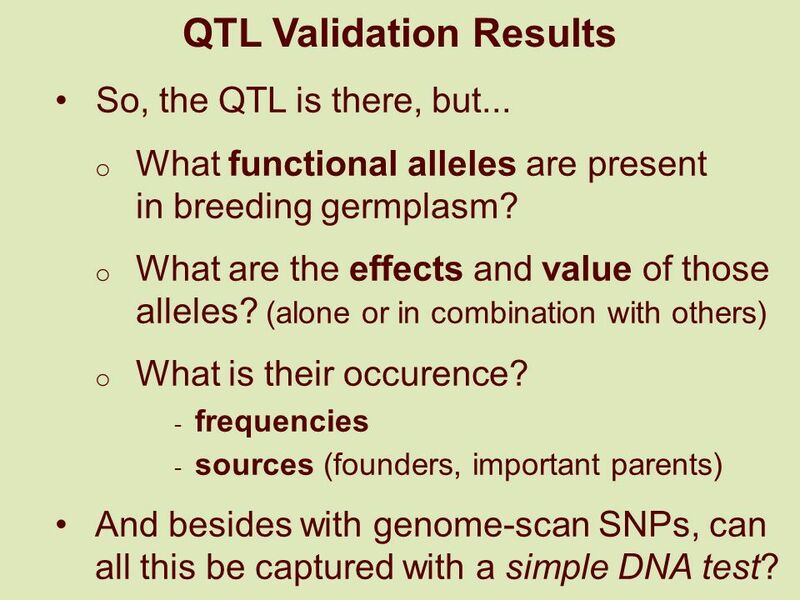 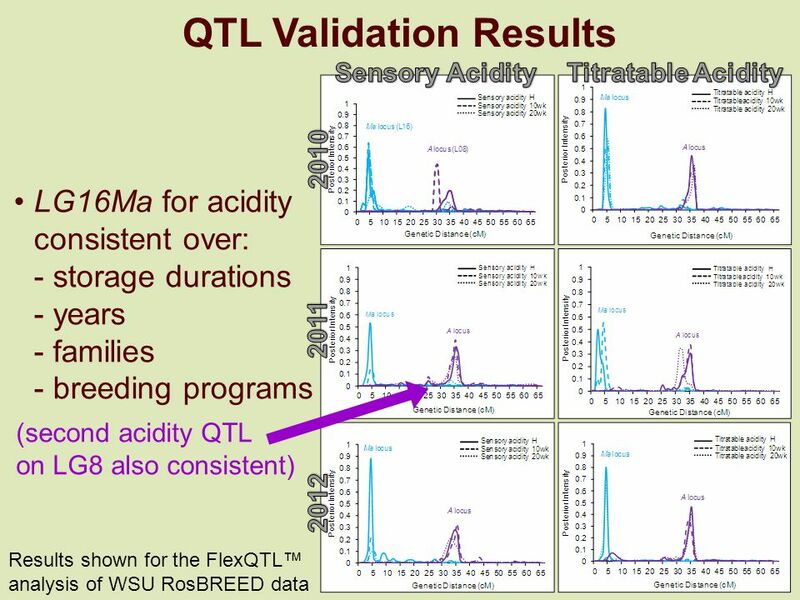 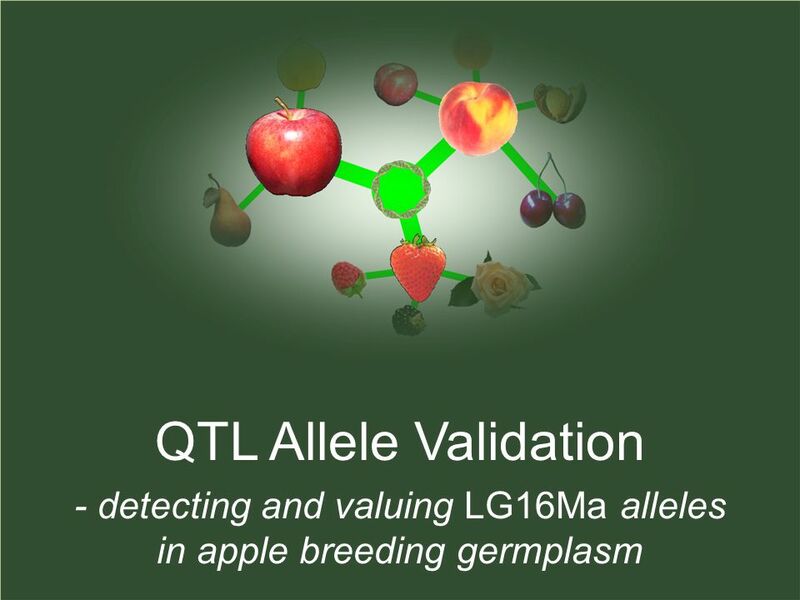 16 QTL Validation Results So, the QTL is there, but... o What functional alleles are present in breeding germplasm? 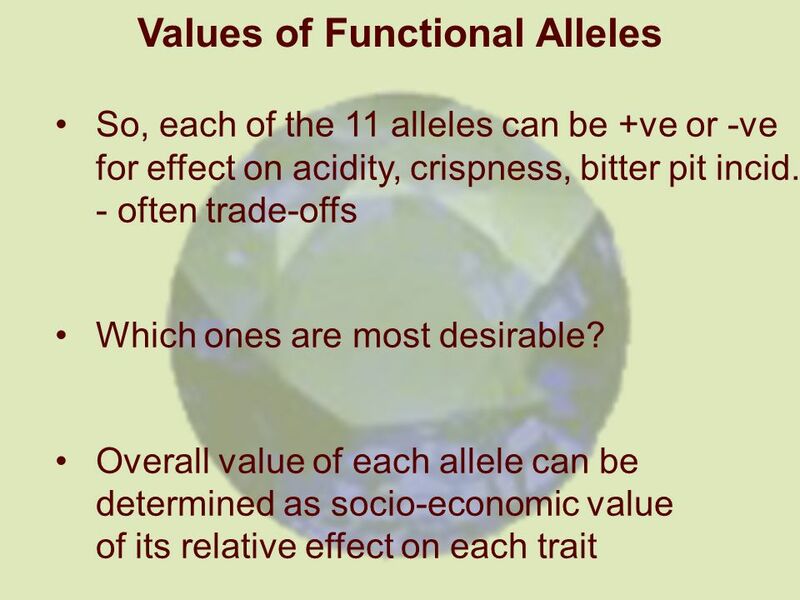 o What are the effects and value of those alleles? 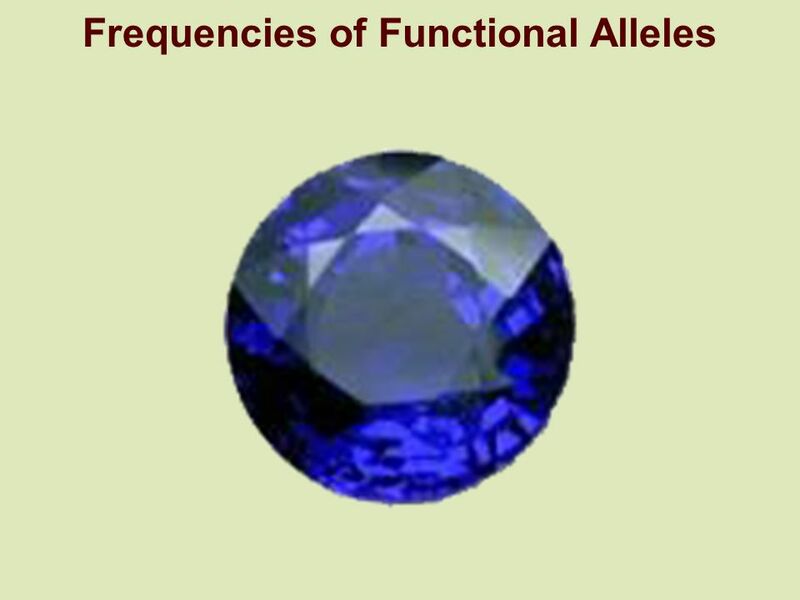 (alone or in combination with others) o What is their occurence? 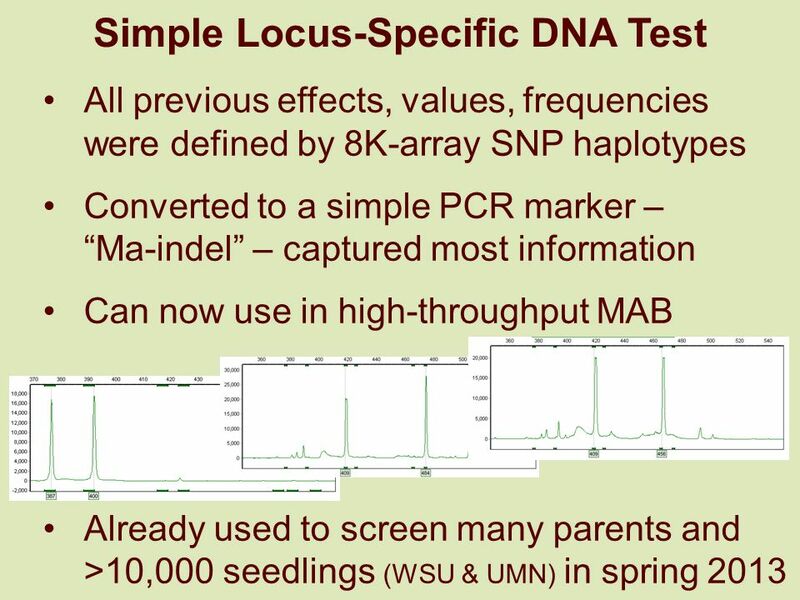 - frequencies - sources (founders, important parents) And besides with genome-scan SNPs, can all this be captured with a simple DNA test? 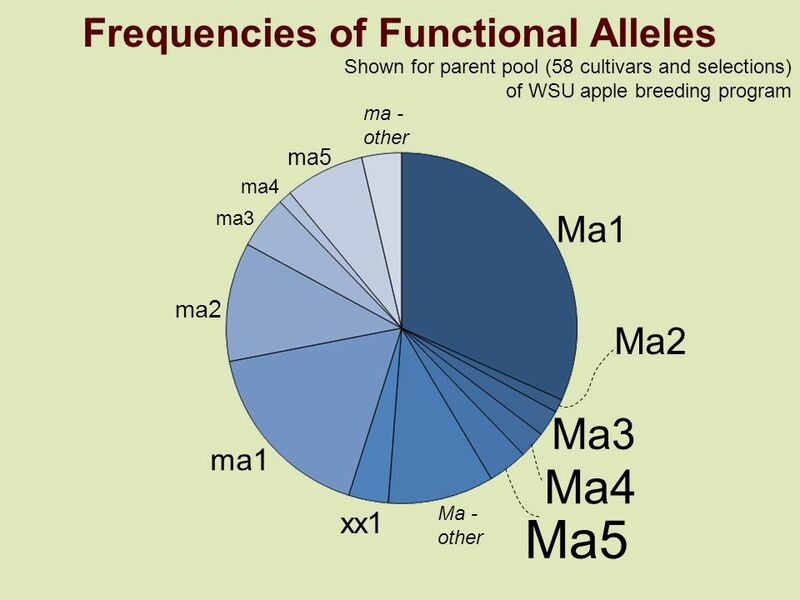 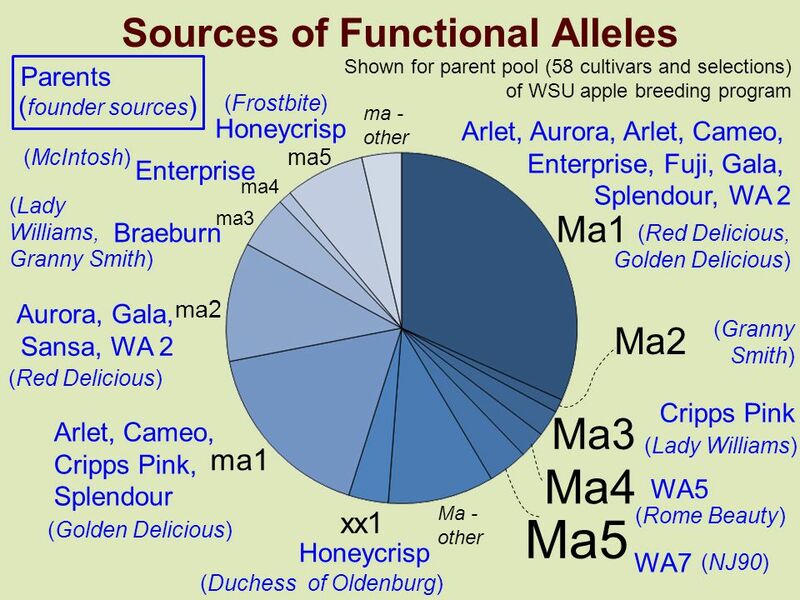 18 Functional Alleles Present With SNP and SSR haplotyping: o 11 alleles in Washington State Univ. 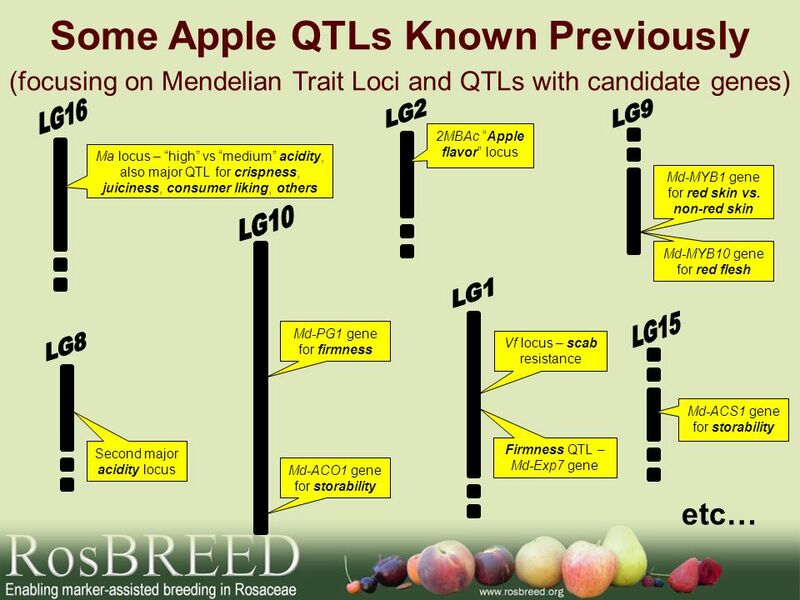 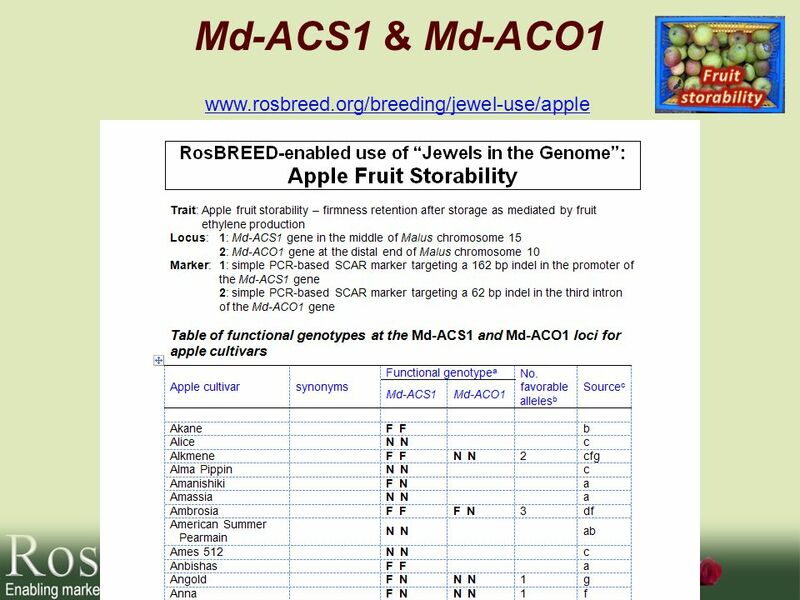 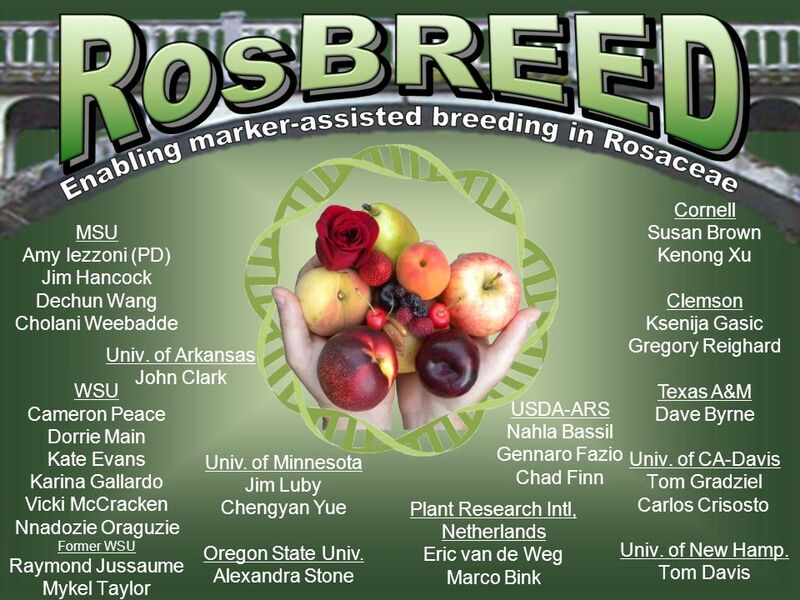 apple breeding program germplasm o 15 more in Univ. 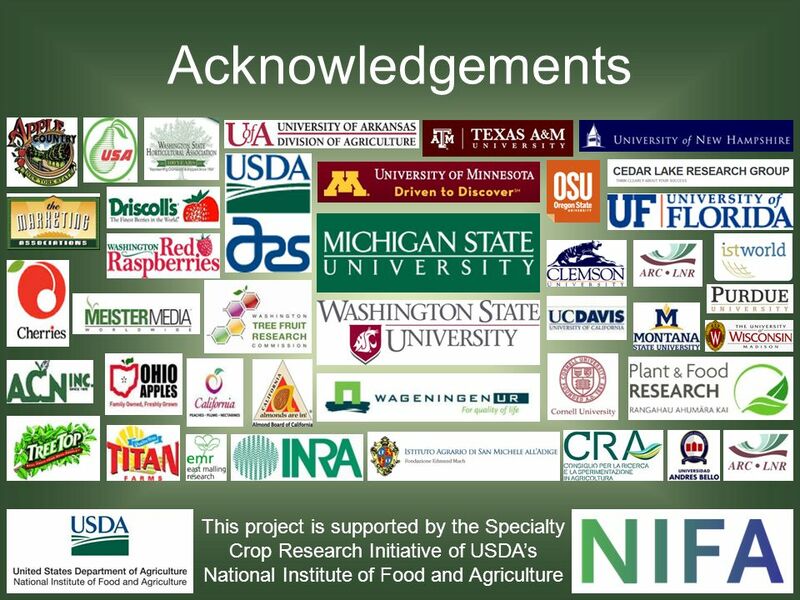 Minnesota and Cornell Univ. 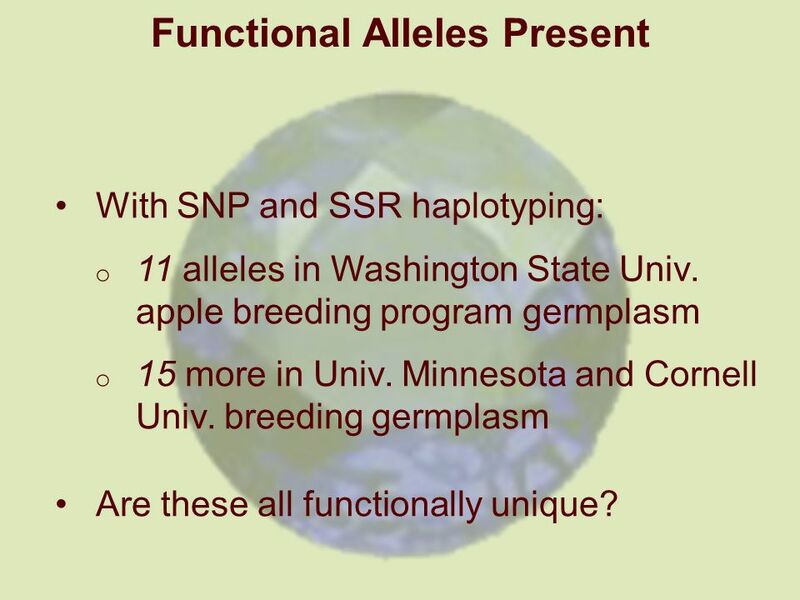 breeding germplasm Are these all functionally unique? 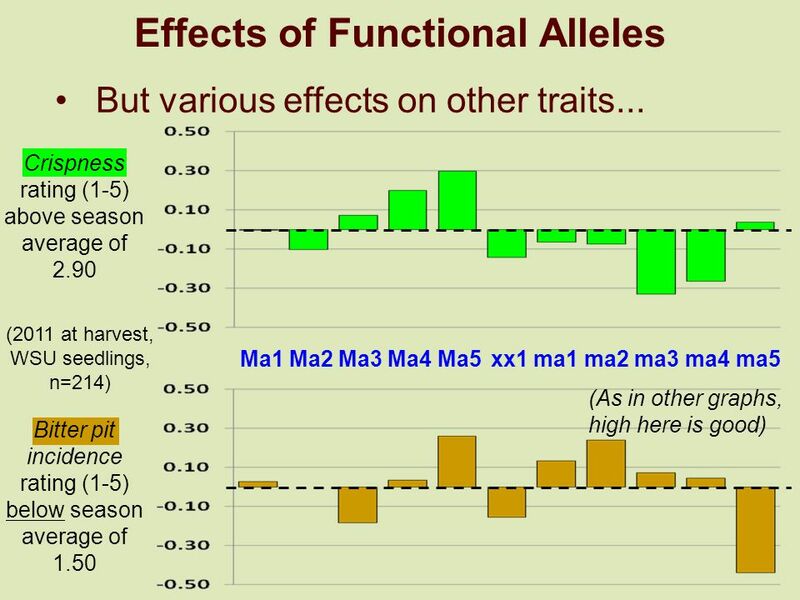 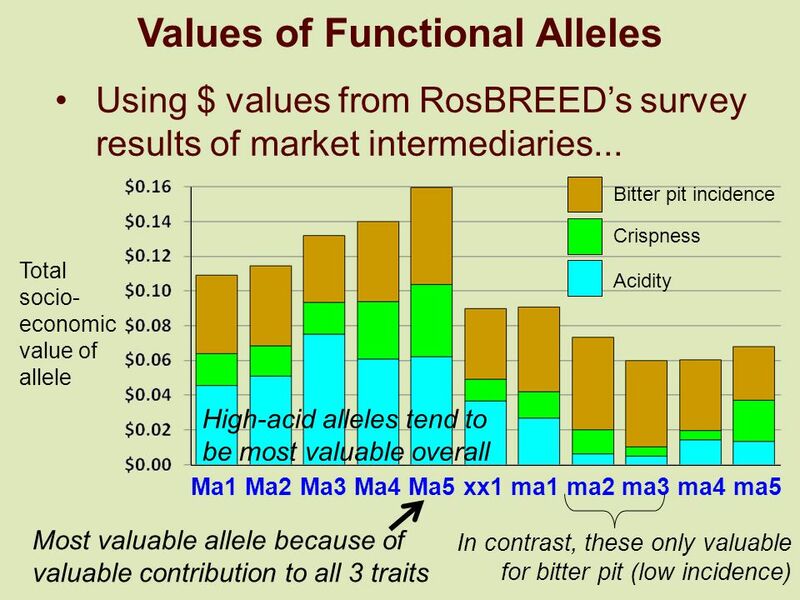 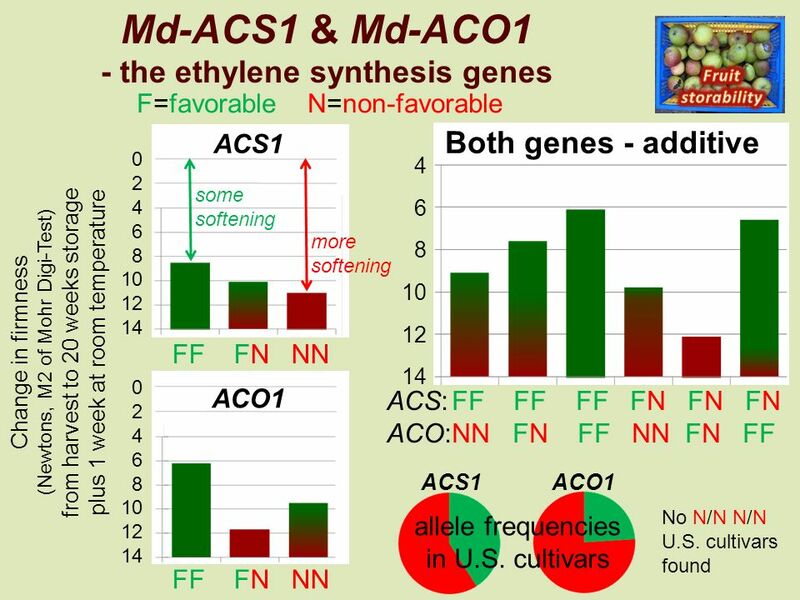 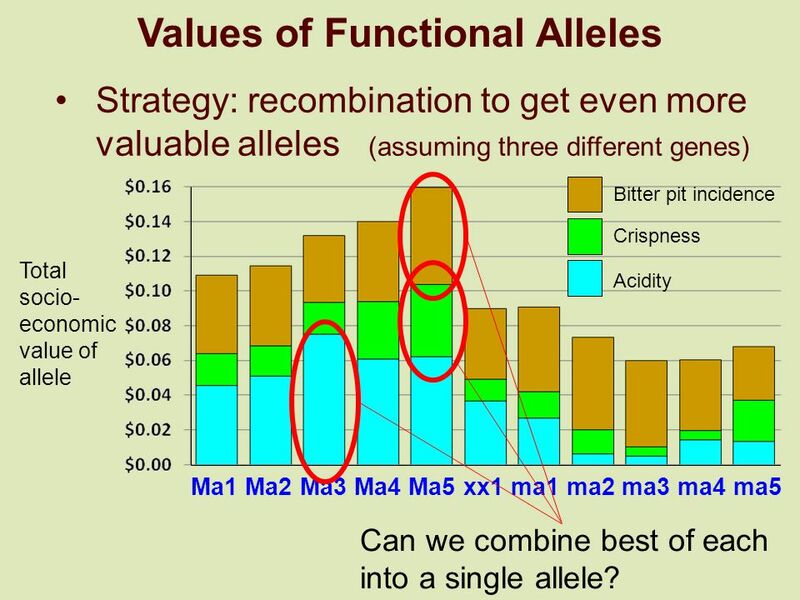 24 Values of Functional Alleles Strategy: recombination to get even more valuable alleles (assuming three different genes) Ma1 Ma2 Ma3 Ma4 Ma5 xx1 ma1 ma2 ma3 ma4 ma5 Bitter pit incidence Crispness Acidity Total socio- economic value of allele Can we combine best of each into a single allele? 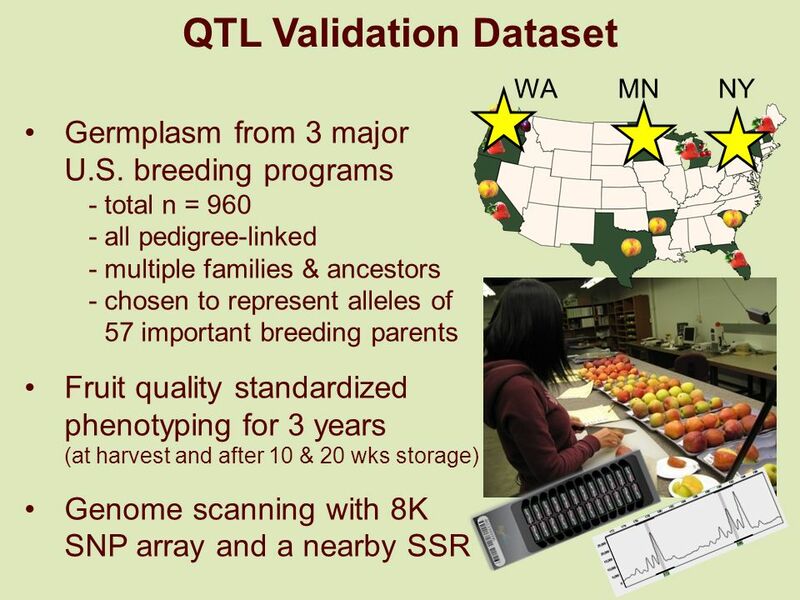 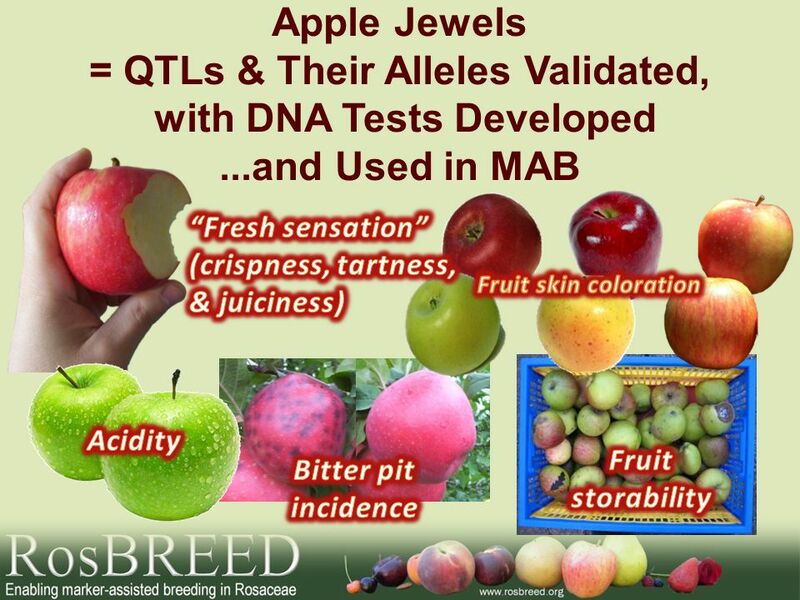 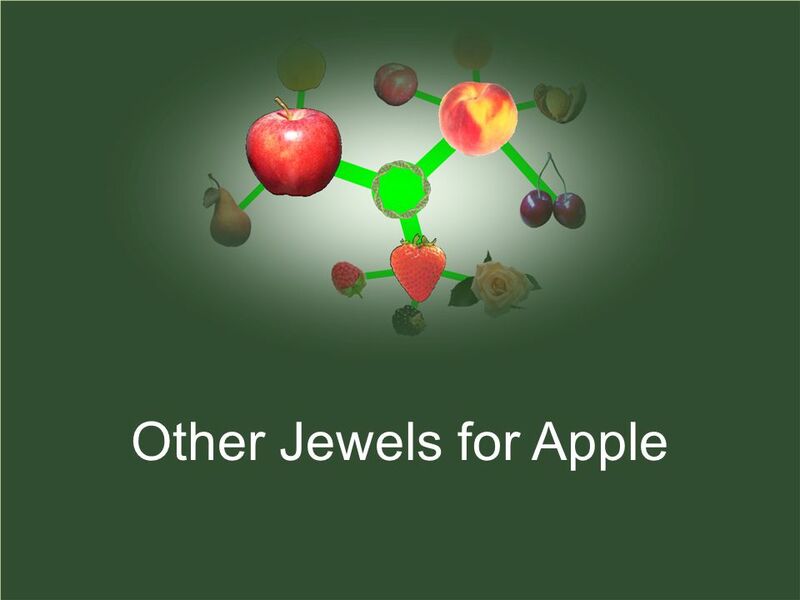 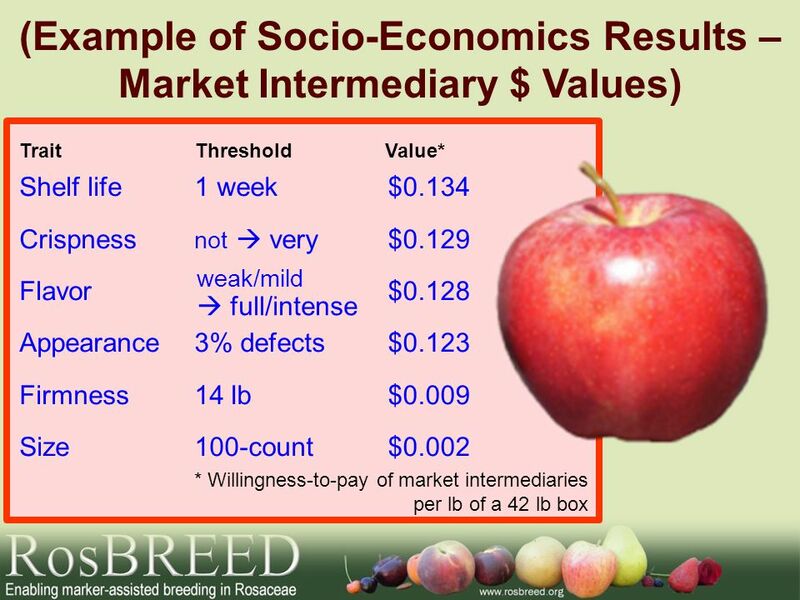 Download ppt "QTL and QTL allele validation in apple Sujeet Verma, Cameron Peace, Jim Luby, Kate Evans, Susan Brown, Matt Clark, Cari Schmitz, Yingzhu Guan, Ben Orcheski,"
AppleApple Variety Here is a collection of Apples I found at a Local Hawaii Market. 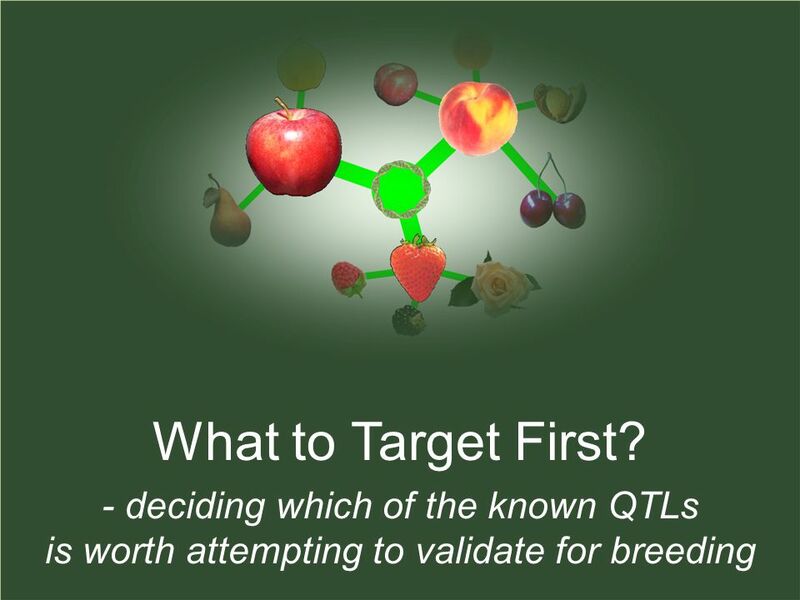 MARKER ASSISTED SELECTION Individuals carrying the trait of interest are selected based on a marker which is linked to the trait and not on the trait itself. 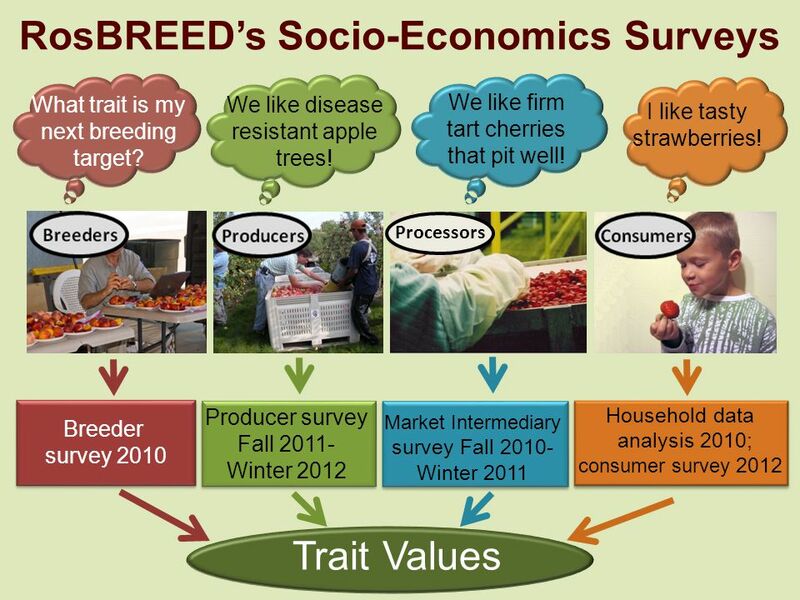 From Natural Diversity to Better Cultivars 10 January 2013 San Diego, California.